Even more exciting, the Dashboard is a tool that helps you find the most effective changes that you can make to help you reach your goals. These changes are your “Action Plan” for success and you can see them every day on your personal Dashboard. 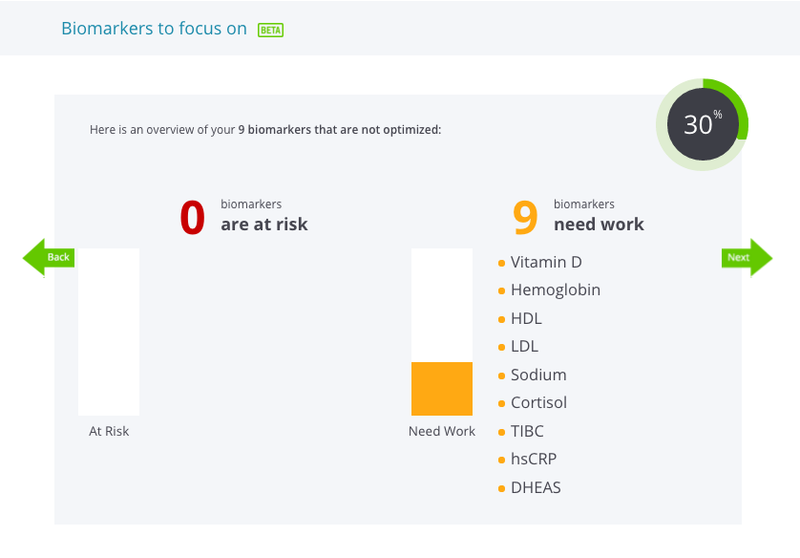 Behind the scenes, InsideTracker’s smart algorithm starts by looking at your results for up to 30 biomarkers in your most recent blood test. Then, it connects your personal biomarker data with up to 14 goals such as: lose fat, boost energy, gain muscle, fight aging, reduce stress, and build endurance. That’s right, we help you get the things you want. Here at InsideTracker we get it - there are lots of different paths to your goals. What you eat, how you exercise, whether you take supplements, and all of your daily living choices are unique to you. Do you want to improve your biomarkers through food? No problem. 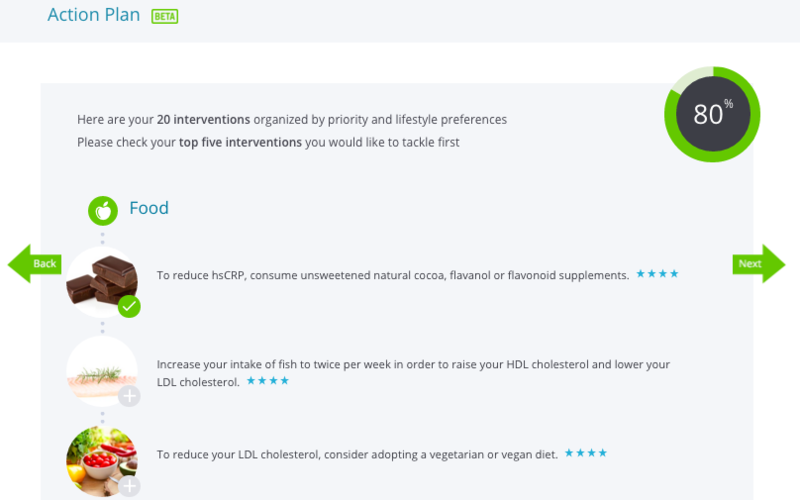 InsideTracker will show you nutrition recommendations first. Is exercise your thing? Great! InsideTracker will prioritize exercise. From our database with more than 2,000 recommendations, our smart algorithm will find the 20 actions best suited to move you toward your goal. Then you choose your top 5. 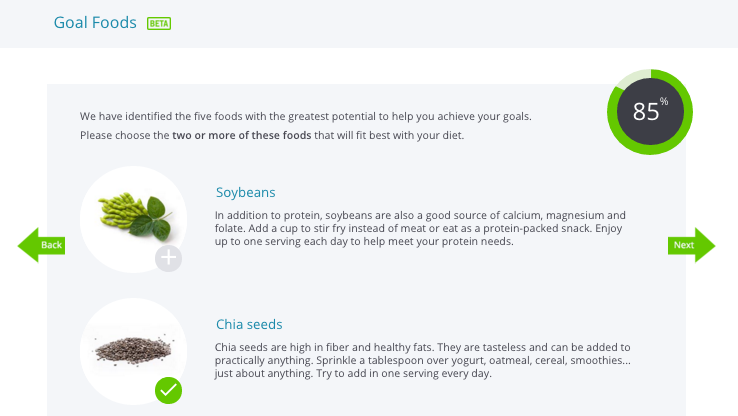 To speed your success even more, the sophisticated algorithm searches our database of over 8,000 foods to establish 5 “Goal Foods” that will help you reach the two goals you’ve picked. All “goal foods” are rich in nutrients that will help optimize the biomarkers related to your goals. Commit to adding 2 or more foods to your daily meals and you’ll be on your way! But don’t worry. You won’t be alone. 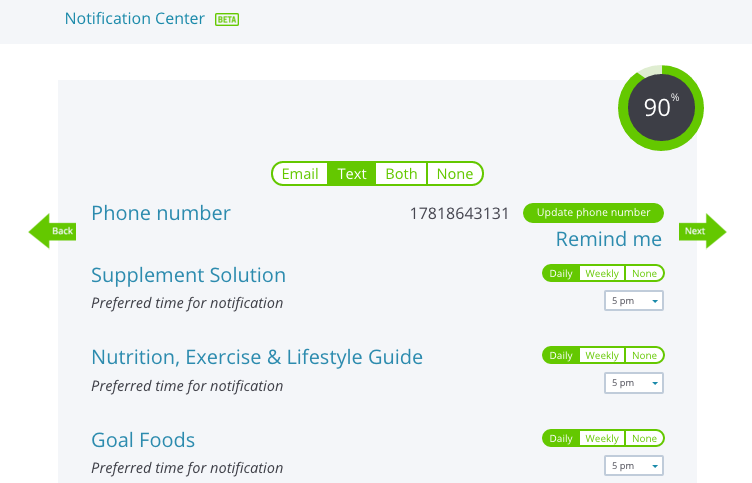 We will send you reminders - email or text, daily or weekly, you can even select the time of the day - to help you turn your new exercise, food, and/or supplement plan into a new habit. It’s our way of keeping you on the InsideTrack to success! It’s easy! You can create a completely personalized Dashboard in just a few minutes. If you have current blood test results, when you log in, InsideTracker takes you directly into the process. If your last test was over a year ago, and you’d like to build your Dashboard, just click the Dashboard tab in the navigation bar and you’ll be on your way. Creating your Dashboard begins with a quick overview of your most recent test results. After all, how can you get where you’re going if you don’t know where you’re starting. First is the big picture: how many biomarkers are optimized, need work or are at risk - and which ones are most important. If you have more than one test, then you see how your latest results compared to previous ones. Now that InsideTracker has shown you the 20,000 foot view, let’s zoom in a little closer. Which biomarkers need the most work? Just go to the next screen to see a list. 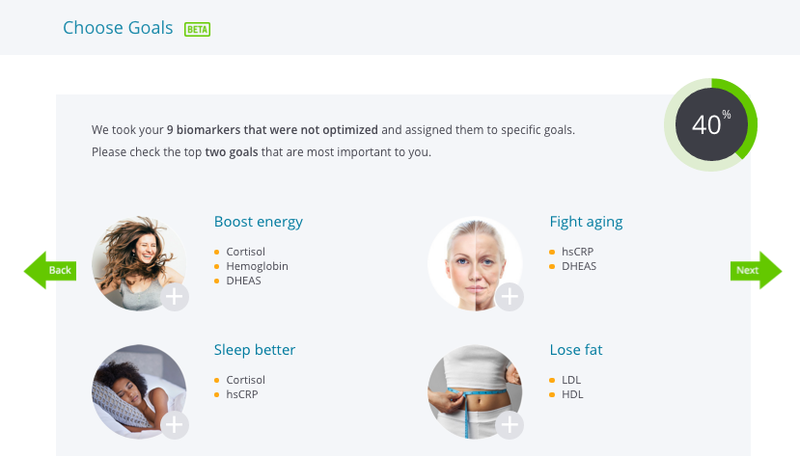 On your Dashboard, you can see the answer: from losing weight and building endurance, to boosting brain power and staying younger longer, your biomarkers are connected to up to 14 goals. The goals are ordered by InsideTracker’s ability to help you. The goals we are most able to help with are on top with the rest ranked in descending order. For each goal, improving the related biomarkers will speed you on your way to success. So what are your goals? What do you want to achieve? Just pick two and get started! What’s that? You want to boost energy, sleep better, lose fat, and fight aging. No problem! We’re confident that you can do all those things. But we’ve found that narrowing your focus makes it easier to stay on track. So choose two goals. When you’ve finished with the first two goals, you can choose 2 more. Bonus: you can change your mind at any time. So now that you’ve set your goals, tell us which types of changes will work best for you. Would you rather add some new foods to your diet, try a new exercise regimen, adopt some new healthy living habits, or start taking a supplement? Just tell us your preferences, then stand back and let our algorithm work its magic! Based on your personal data, your biomarker results, your selected goals, and your preferred types of actions, the algorithm extracts from our database of more than 2,000 recommendations up to 20 recommendations that will be the best fit for you. We know that 20 is a lot! So, just as you chose 2 goals, you also choose 5 recommendations - the 5 changes that you believe will be easiest for you to turn into healthy new habits. If fish is not your fav, that’s OK. You could eat more beans, or have some cocoa. From nutrition, to exercise, to supplements, to healthy living choices, the recommendations you choose for your Action Plan should fit comfortably into your life. 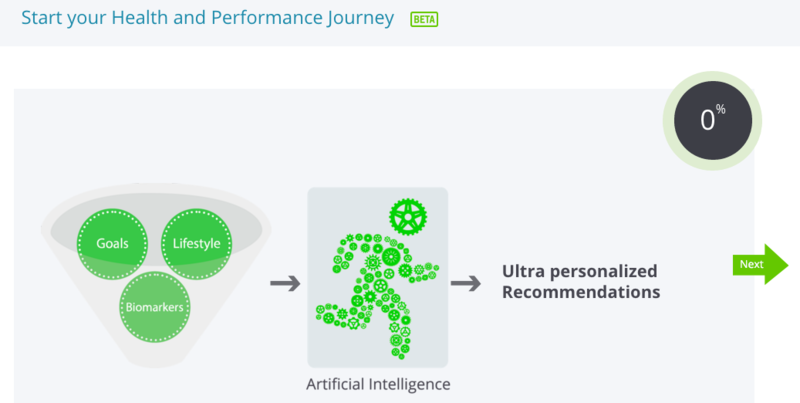 In addition to your Action Plan, InsideTracker’s algorithm also presents 5 ultra-personalized Goal Foods from a database of 8,000 possibilities. Goal foods are nutrient rich in the macro and micronutrients that the blood test shows your body needs. They match your goals, biomarker levels, and dietary preferences. So if you’re vegetarian, your Goal Foods will be vegetarian, too. From the recommended foods, you can narrow it down to 2 or keep all 5, whatever is most appealing to you. Would you like a little help remembering to grab those foods at the grocery store, to start that HIIT class at the gym, or to take that supplement? The Dashboard comes to the rescue again with InsideTracker reminders. Just tell us whether you prefer email or text, how often, and when. InsideTracker will take it from there and remind you to stay focused on your goal(s). Congratulations! You’ve successfully created your Dashboard - your personal InsideTracker guide to success. Featuring your goals, results, goal foods, supplement plan, recommendations, and a sneak peek at your InnerAge, you're sure to stay motivated! Post it on your refrigerator, pull it up every day on your phone, share it with your friends. And, please, come back and tell us how you are using your personal health Dashboard. We want to know, because we want to make it even better. 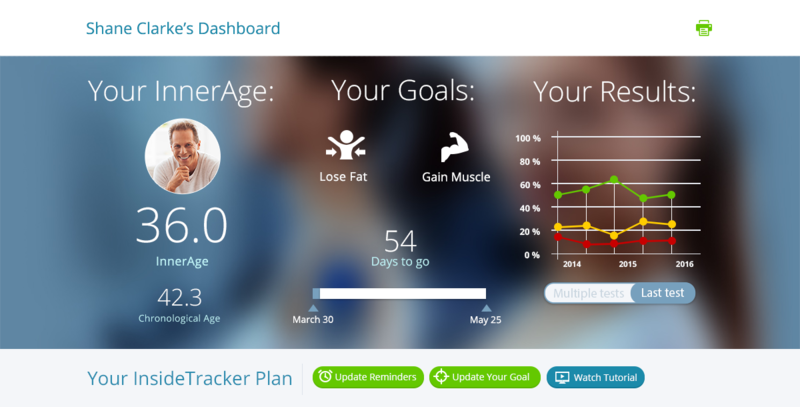 Build your personal InsideTracker Dashboard today and follow it to your goals.